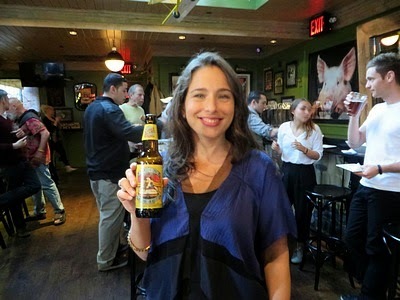 Coney Island Brewing Company's "Tunnel of Love Watermelon Wheat"
Richard Thompson, "Wall of Death"
I wasn't sure what to expect when I was invited to a tasting of Coney Island Brewing Company's summer seasonal brew, "Tunnel of Love Watermelon Wheat." 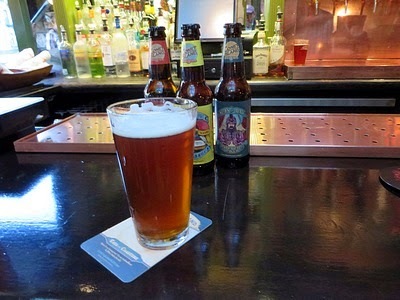 You can see it, freshly drawn, in the photo above, sitting on the bar of The Brazen Fox, where the event was held. Before I tasted it, I had Richard Brautigan's words in mind, and feared I might be getting something akin to alcoholic Hawaiian Punch. I took a sniff--hop aroma prevailed, but with a little hint of fruit--then a swig. Like Richard Thompson said I might be, I was amused. Even pleased. This was beer, not melon juice, though the melon flavor was there, working well with the cascade and citra hops, and with the two row barley malt, malted and unmalted wheat, and dark crystal malt. It's not something I'd make my everyday beer, but I'd be glad to take it to our roof deck or to a beach on a summer afternoon with some chips and salsa. At 4.8 percent ABV, you can have more than one without fear. On the way in we were greeted by Sarina Appel, who encouraged me to try Mermaid Pilsner and Seas the Day IPL, both of which I'd previously tasted from bottles (see here and here), on draught. I did, and didn't taste any major difference from my earlier impressions, other than that the Pilsner seemed a bit more assertively hoppy, and the India Pale Lager perhaps a bit less so, than I remembered. My wife and I had a delightful and informative conversation with Coney Island's brewmaster, Jon Carpenter. Actually, my wife got the conversation going, asking Jon about the varieties of yeast used in brewing. Jon is a native Californian and a graduate of U.C. Davis. 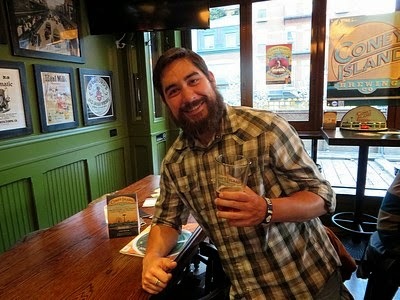 He has previously worked for L.A.'s Golden Road and for Dogfish Head in Delaware, makers of 90 Minute Imperial IPA (I've yet to try their 120 Minute, but must soon; stay tuned). I also had the opportunity to meet Alan Newman, head of Alchemy & Science, Boston Brewing Company's "craft beer incubator," which now owns Coney Island Brewing. Alan told me a picaresque tale of how he and Steve Hindy, President and co-founder of the Brooklyn Brewery (see my reviews of their brews here and here and here) were at a convention in Las Vegas when the 9/11 attacks occurred and, because all air transport was grounded, bought or rented (I can't recall which) a van and returned by highway to the East Coast. As my friend The Rev. Nicholas Temple reminds me, the 24 hours that began at sundown today (Sunday, April 27) and end at sundown tomorrow constitute Yom HaShoah (יום השואה), or Holocaust Remembrance Day. 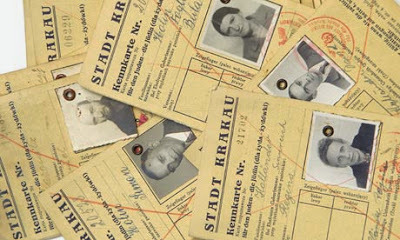 The image above is of identification papers issued by the occupying German forces to Jewish residents of Krakow (or Krakau, in German spelling), Poland. All of these people may be presumed to have died in the Holocaust. The image is from an article posted on January 27, 2012 in The Northerner Blog of The Guardian. January 27, the date of the liberation of Auschwitz-Birkenau, largest of the Nazi extermination camps, is recognized as International Holocaust Remembrance Day or Holocaust Memorial Day, in many countries. The Guardian story is about remembrance of the Holocaust in the City of York, England, which itself, in medieval times, was the site of a massacre, reminiscent of Masada. Nick's post, linked in the first paragraph, includes a list of mass killings subsequent to the Holocaust. Even on a smaller scale, but just as heinous, murder based on ethnic or religious prejudice continues today.